An early 5am start to the day, weather was dry, a bit fresh, but forecast mid twenties and sun during the day. All my fellow racers were wrapped up warm with leg and arm warmers and windproof jackets, but I decided to keep it simple and light, with shorts and cycle shirt. A mass start at 6:45am, and 2500 cyclists set off through the narrow streets of Meringen. A short sharp hill soon got the legs warmed up and we sped down through the picturesque village of Innertkirchen. This first 32ks was a steady climb up to Grimsel pass (2164m), a 1570m ascent. I felt good, the bike was going well and I was overtaking plenty of groups. The weather had warrmed up and the scenery was stunning, looking over the Alps, glaciers and cobalt blue lakes. After about 20k, the climbing really started, back and forth round hair pin bends, the first of many. I had aimed to reach the first pass by 9am, and came in at 9.15..so far so good. First feeding station was a mad frenzy of people and bikes. I stopped only to refill a water bottle, 3 mins later I was off again…very much focused on race mode, where every minute counts. Flying down the hair pin bends from Grimsel pass, there was a heart stopping moment when the tarmac changed to cobbles, at over 60kmph I was shaken around and pretty unsteady. Recovered to continue speeding down, looking to the steam train below and across to the winding Furka pass. I was constantly on the brakes, trying to keep my speed down, and my forearms were shaking. Through Gletsh and forked to the right through a beautiful valley with picturesque wooden chalets. I suddenly realised I was cold, my teeth were chattering and arms were freezing. I contemplated stopping into a bike shop as I passed, but thought it was a bit ridiculous to take time out during a race for shopping, so it was head down and carry on. Only 30 minutes since the top of Grimsel pass and it was time to start climbing again. 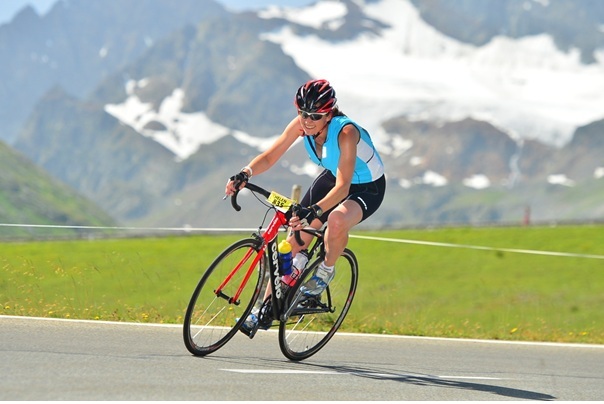 A shorter, but steeper 13km climb, covering 1130m, to 2,476m – Nufenenpass. This seemed to go on and on, my legs were definetly tiring – my knees and thighs were starting to hurt and I could feel my lower back with every turn of the pedals. The crowd had thinned out now. As I got nearer the top, the people I had overtaken at the feeding station overtook me. The realisation that this was going to be a tough race started to dawn on me – over optimistic targets of finishing in 8 hours were clearly not going to happen. After about 1hr 30min of ascent I was very happy to see the feeding station and this time allowed my self some sustenance – a banana and power bar. Hardly fine dining but tasted amazing, after the sweet, sticky gels I had consumed so far. Allowed myself 8 minutes at this station and then I was off. Speeding fast down Val Bedretto, in the Italian part of Switzerland. As the altitude dropped, the temperature warmed up considerably which I was glad off. I don’t remember much of the descent. There were very few cyclists with me, and I hoped I had passed a few again at the buffet; but equally they may all have been miles in front. The Gotthard pass loomed above – only 13ks away but a vertical kilometre higher, at 2,107. I set off at high noon, in high hopes that I would be at the top enjoying a warming soup and pasta by 1:15pm. The first kilometre or so was tarmac with intermittant cobbles – not to bad…until the tarmac completely stopped. Kilometre after kilometre of bumpy steep cobblestone road – forcing the bike over them. Then as if things could not get any harder, a cold wind started, adding further resistance. My legs were really heavy, this was becoming very much a mental endurance test. Just keep peddling, don’t stop, just to that corner, ok, now the next one, enjoy the brief respite as you go down into the camber before the pain in the knees takes hold again as you climb out…think of the buffet, second last climb…keep going. Finally, sometime just before 2pm the top appeared. I saw a marquee on the horizion…ahh, a sit down buffet. I was ready for food. Yet it was not to be, the marquee belonged to another function and not a bowl of pasta, or even a banana in sight. Still I had to stop, just for 5 minutes to stretch out my legs and back and briefly admire the barren wind swept beauty of the pass. With no windproof jacket or arm warmers, there was nothing for it but to start yet another cold, fast descent down. The road was busy, motorcyclists roaring up from behind. Head down, into the wind to the ski resort of Andermatt – 12ks away and 670 metres below. At last the very welcome sight of the next buffet appeared on the horizion. I realised just how hungry I was. The gels were keeping me going but I felt empty. Bread, cheese and bananas filled me up and I allowed myself a 20min stop. It was no longer about racing and getting the fastest time but about simply completing the event. After eating and a brief rest I felt positive again. It was only 1 more pass, it could not be as bad as the mighty Gotthard and surely it was only about 15 or so kms, an hour and a half climbing max, I should be there by 4pm and back in Meringen by 4.30, after a fast descent. Susten pass was not nearly as steep, through a long beautiful valley looking up to another glacier. If it had been the first pass of the morning I could have easily managed it. However, my knees and back were now aching, and the going was slow despite the relatively easy gradient. My stomach was cramping, I guess from having eaten at the buffet and being squashed up for hours on end, and this was making it difficult to breathe deeply properly. After about an hour, I felt confident that just round the next corner, past the snow barriers, I would see the top just in front of me. I did indeed see the top, but it was not just in front of me..it was far away, looked at least another 8k. I was crestfallen. I felt completely dejected, I had mentally prepared myself for a 90min climb and this was going to take at least another hour. The road was cut into the steep cliff to my right and dropped off to the left, there was no where to stop. I had to keep going until a passing place appeared. My knees were so sore it was painful just to turn my foot to get out of the pedal. I got off the bike, stretched out my back and legs, enjoyed a power bar, and gave my self a talking to. Not finishing was not an option, it looked like it was about to rain, so I had better get back on that bike, forget about sore knees, and just get on with it – it could not be more than 6ks – 35mins that’s all. Just before 5pm I reached a cold and overcast Susten pass (2224m). A warm bouillon was just what I needed, accompanied by yet more bananas and power bars. I knew I would finish now, only a 30km descent to go. Yet even that did not fill me with great cheer, I was really cold. The clouds had come in and rain was threatening. I looked on enviously as my fellow cyclists put on leg and arm warmers, windproof coats and gloves. I set off in my Tshirt and shorts. Another fast descent, in and out of tunnels where I could not see at all, and simply hoped the road surface was OK. A final 30k, down 1600m to Meringen. Very quickly the air temperature warmed up and I started to enjoy the final push. I seemed to have a second wind, the bouillon had done the trick. It was now a beautiful evening. Into the valley we started from, past Innertkichen, the same short sharp hill that I had started on over 10 hours ago. The finishing line ahead, the crowd cheering,over the last timing belt and I was finished. After 10 hours and 31minutes I had made it.